Christmas in England has been cold, wet and windy. There was none of the snow that covered the roads in a thick sheet of white powder when I visited two years ago. Everyone I met was talking about how mild the weather has been, until half of the South West sank below the water level. Still, for all of the cold, I feel lucky to have returned to what I think is one of the most beautiful areas of Britain. Here are some of my personal highlights for anyone who happens to be visiting Somerset. Ham Hill offers a panoramic view over the Somerset Levels, which makes the Prince of Wales a great choice for an afternoon pint. Village life revolves around the local pubs and the Prince of Wales on Ham Hill is one of the most popular. Though the food is mediocre and the drinks are slightly overpriced, the location is perfect offering a panoramic view over the Somerset levels. Make sure to take a walk around Ham Hill before settling down for a drink. The picturesque village of Dunster is the perfect place to spend a relaxing day. Set in rolling wooded countryside interspersed with open green fields, the medieval village of Dunster is one of the most picturesque villages in Somerset. The main road that cuts through the centre of Dunster is lined on either side with old white washed buildings. On the outskirts of the village there are babbling brooks and small thatched stone cottages. Overlooking everything, with an imposing view over the surrounding countryside is Dunster Castle. View of Glastonbury Tor in the early morning, taken from the Somerset Levels. There is more to Glastonbury than the world famous festival that hits the international headlines every other year. Set some time aside to explore the ruins of Glastonbury Abbey, which before the rule of Henry VIII was one of the richest and most powerful abbeys in England. In addition to the Abbey, visit Glastonbury Tor. This site was allegedly once part of the kingdom of King Arthur (you know the one with the round table). The Somerset levels are prone to flooding, but the last two years have been particularly severe. 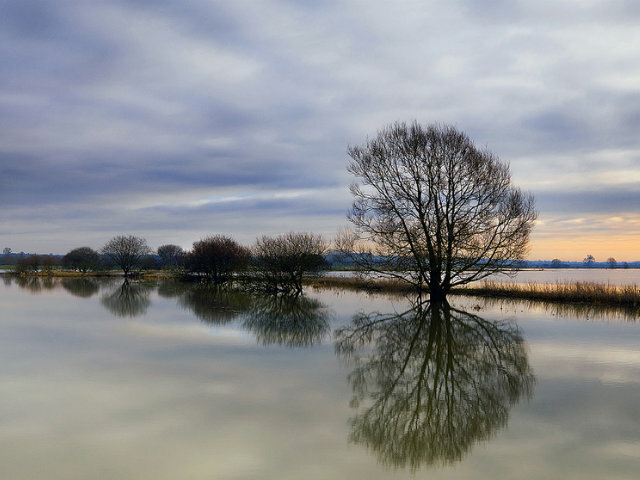 The Somerset levels is an amateur photographers and nature lovers dream. The only thing breaking up the miles and miles of fertile farmland are the canals and dykes, making it the perfect place for long cross country walks. If you happen to be a photographer, wake up early for a view of the low lying mist that hugs the land just after the sun rises.